One of the pitfalls of having a device that is rapidly grown in popularity is that it becomes an irresistible target for people with no-good intentions. Reports are coming in that yet another Android virus has been unleashed and has already impacted a sizeable number users in China, causing their phone bills to balloon to catastrophic levels. The Android virus has already been spotted in 9 different 3rd party app markets in China, infecting more than 100,000 users as of this writing. According to TrustGo, once the Android virus has been downloaded, it will begin to place orders for paid apps without any notification to the user. It begins by changing the Access Point Name (APN) to CMWAP, allowing it to go past log-in requirements. The malware can also bypass verification techniques even those that are SMS and Captcha-based. Security experts from TrustGo suggest that users should only download apps from trusted vendors and should make sure that their devices are adequately protected by having some sort of real time mobile security scanner that could held prevent virus-driven downloads. While there is no guarantee that taking these steps will ensure you a virus-free experience with your Android device, it sure can minimize the possibilities of you dealing with this type of headache. 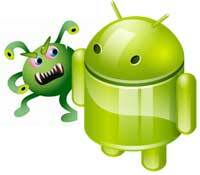 Do you have any personal tips you can share as to how you can avoid viruses on your Android devices?